“Frantic” isn’t a word that comes into play in most board games. This is a hobby that gets its kicks from things like maximizing the efficiency of your electrical grid, after all. Absorbing? Entertaining? Challenging? Sure. But frenzied? Hardly. In the last few years, though, a handful of games have been kicking at board games’ more rigid borders, and real-time fare like Escape: The Curse of the Temple, Space Alert and the new XCOM: The Board Game are finding novel ways to test players’ strategic skills on the fly. 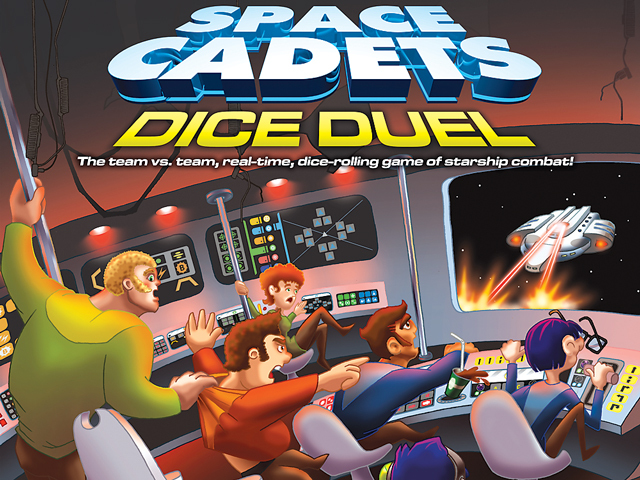 Even among the new crop of real-time games, though, Space Cadets: Dice Duel is an anomaly. Unlike those others, SC:DD doesn’t build the pressure with outside technology. There are no pre-recorded audio tracks or fancy apps designed to keep you on track. All SC:DD needs to create its barely controlled chaos are a few boards, some committed opponents and a heck of a lot of dice. Most of SC:DD’s premise is right there in the title. You and your friends (in theory as few as two people, but it’s best with at least six) are divided into two teams of space cadets, and you’re duelling. The first team to blow up the other guy’s ship wins. But getting into a position to do that involves a whole lot of prep: you’ve got to build your torpedoes, lock onto your target and — not as simple as it seems — make sure you’re pointed in the right direction. Ideally, you’ll have enough teammates to divide up the work. One person mans the weapons station, rolling dice to prepare your attack. Another steers the ship and mans the tractor beam, avoiding inconvenient asteroids and moving opponents’ ships into awkward positions. Most importantly, each team has a captain overseeing the operations — which more often than not means screaming at your friends to get those shields up and turn this damn ship around. Because SC:DD’s ships aren’t especially nimble, if you aren’t careful, you’ll end up running into your own mines. Or firing off your torpedoes before they’ve even been built, leaving you a sitting duck. Communication is the key, and it’s easy to picture teams working like well-oiled machines, even if my playthroughs involved more flailing and profanity. A word of warning: SC:DD is an inherently nerdy game, and if your friends are the type to turn their noses up at Star Trek marathons, you won’t likely get much traction. It’s as much about committing to your role as it is about strategy. But with the right group of folks, it’s a pretty unique experience: a frantic, frenzied board game that leaves you with some stories to tell.